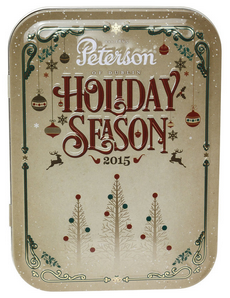 The Christmas themed blend Holiday Season is the epic finale of a great year of limited edition tobaccos release by Peterson of Dublin. 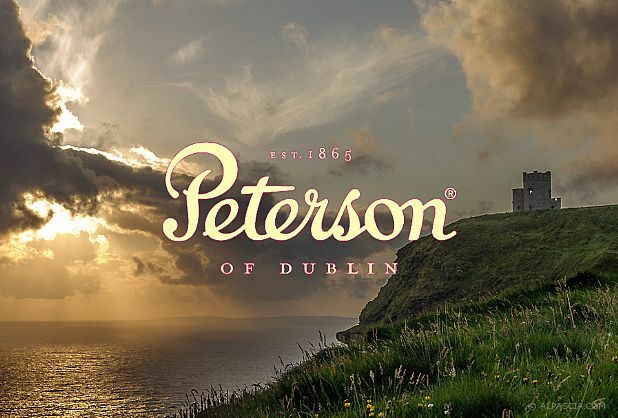 The year began with the St. Patricks day blend, moved into the Summertime blend, celebrated the bicentennial of Peterson with Special Reserve, and ends here with Holiday Season. Blended from Kohlhase and Kopp, Holiday Season is one of those blends that instantly transports your mind from whatever you are doing to a world where Christmas is nigh. What is more, the Peterson 2015 Christmas tobacco pipe collection shares a common theme with the tobacco blend, making this a lovely combination. While I was surprised as to how delicious this tobacco was, there were a couple issues I take with tobacco. For regular followers, you will notice that I have lately been suffering from some form of “anti-aromatic-distaste”. I don’t think I am being bias, but recently I have struggled to find a good aromatic tobacco. It is my hope that the 2015 Holiday Season tobacco will solve my recent dissatisfaction of aromatic blends. Perhaps my favorite aspect of this blend (not to diminish anything else) is the wonderful packaging. The large box style tin has a swinging door and a sealed 100 gram bag of tobacco. And the greatest part is the modern and appropriate tin art. It truly warms my soul to see tobacco companies updating their tin art and appealing to the growing population of millennial pipe smokers. The 2015 Holiday Season is a solid aromatic tobacco consisting of Virginia, Burley and Black Cavendish tobacco. This blend is a very rough ribbon cut. One of the small issues I take with this blend is that after my tin was halfway empty, the remaining tobacco was incredibly grainy, almost as if my tin was the bottom of the packaging bag. Small issue, but annoying. The tin note description on the back of the tin is perfect: berries and cognac. There is clean and crisp aroma of berries fills your senses, but all with the subtle smoothness of cognac. The tin note carries over perfectly into the flavor profile of this blend. It tastes of a clear, slightly spirited berry blend. On the first light, this blend is incredibly clear, and surprisingly remains clear throughout the entire bowl. My personal experience was that I enjoyed smoking this in a small pipe. For me the berry flavor was overwhelming after a few minutes. However, this is a personal preference and the fact that the flavor remains as strong is a great attribute. Another surprising element is that this heavily cased blend smoked mostly dry. In some of my smaller pipes that had less surface area there was a small moisture build up, but honestly I was pleasantly surprised. What I believe is the worst part of this pipe is that it generally needs a few relights through the bowl. The tobacco is very moist. I think you should dry it out for a while before smoking. The gorgeous topping and flavor, once again, carries over into the room note. This Holiday blend is perfect for smoking around guests during the Holiday’s. The warm and enticing aroma is guaranteed to swoon any guests in your vicinity. As with many seasonal blends, I am not going to suggest a traditional food or drink to pair with this item. Instead, sit by the warm fire on a grandeur, brisk holiday night and smoke a few bowls of Holiday Season. If you can surround yourself with loved ones, then this tobacco will be even more fulfilling. In the end, there is no better thing to pair with holiday’s than a perfect landscape and the company of loved ones. Because of the high casing content, this blend can give tongue bite if smoked too fast or if you are not used to smoking aromatic tobacco. The 2015 Holiday Season tobacco is a mild/medium blend. Just the flavor intensity alone justifies this aromatic as something more than just a mild tobacco. I was pleasantly surprised with this blend. Honestly, I expected it to have little flavor and to burn the crap out of my tongue. Thankfully, I enjoyed it. This blend has somewhat revived my hunger for aromatic blends. I give Peterson 2015 Holiday Season a score of 6 out of 10. I feel like six is a strong score for an aromatic tobacco. Order your tin of this limited edition tobacco from a great site like TobaccoPipes.com before it is gone forever! Great review! Like you, I’ve been trending away from aromatic tobaccos of late, but this review certainly tempts me back! Glad to hear it. I think most people eventually float away from aromatics, but it’s important to still appreciate aromatics. I don’t think it’s bad to crave something more, but I don’t want to throw aromatics under the bus just because our taste evolves. Thanks for the comment! I’ve posted a link to your review on my own blog. Great! Thank you sir! I will check out your blog as well. What is the site?